Bringing in the New Year and reflecting on 2014 | Franchising You. Happy New Year! Declare a diet or exercise goal. Check something off your bucket list. Spend more quality time with family. The New Year is centered around creating resolutions which are many times forgotten after a few short months. In addition to creating personal resolutions for yourself, it’s imperative to set goals for your business, too. After all, ‘tis the season for new beginnings. But, let’s not forget to look back on all of the tremendous accomplishments 2014 brought! TWO MEN AND A TRUCK® ended 2014 wit h a bang. Surpassing the addition of 18 franchises in 2013 by signing the 30th franchise agreement of the year December 22. TWO MEN AND A TRUCK® and its nearly 2,200 trucks are on a roll. “Customers continue to support and want us to expand. The bigger our footprint has become, the more people know and understand our brand,” said CFO Jeff Wesley. Ultimately, TWO MEN AND A TRUCK® wants to have a presence across the nation with the services and exceptional customer service for which the company is known. The game plan for 2015? An expansion across California and the western part of the country with an overall goal of 30 new franchise signings with 25 franchise openings. In addition to pushing growth on the west coast, expansion in all parts of the country, including South Dakota, which will give the brand another notch in its proverbial belt, a footprint which will reach into a total of 39 states. On an international level, Wesley sees an opportunity for further growth within Canada, specifically Vancouver. An examination of its international strategy will occur mid-year where an effort to plan a pipeline of international growth for TWO MEN AND A TRUCK® / INTERNATIONAL, Inc. is slated. To continue propelling upward and moving careers forward, the brand will run the Mary Ellen’s Moving People Forward Scholarship for a second year. This program rewards TWO MEN AND A TRUCK® managers who go through special training to become franchisees or operators of their own location(s). The training program is taking achieved success, passion, and the strategic-partnership opportunity to the next level. During the training, participants are expected to attend multiple learning sessions and complete several projects and assignments which have been constructed by the corporate office and TWO MEN AND A TRUCK® franchise leaders. In 2015, the scholarship winner will be awarded a franchise, and additional managers in the program wi ll each walk away with specific skills they’ve learned throughout the educational process. In an effort to keep building on the program’s success, the company is excited to watch this scholarship roll out for a second time this year and in the years to come. So, what can business owners do to move their own business forward in 2015? Wesley always recommends business owners take the time to sit down and evaluate 2014 from a business standpoint. Take stock of both the positives and negatives, and create a written plan with goals for the upcoming year. Creating yearly goals for your business creates a vision and direction of where you want your business to go and adds structure and specifics to increase the chances you’ll remain focused on the stated path. As TWO MEN AND A TRUCK® continues to exceed expectations and goals, we plan to continue expanding in 2015 and beyond. There will be exciting franchise development news all year, and we are looking forward to sharing it with you! 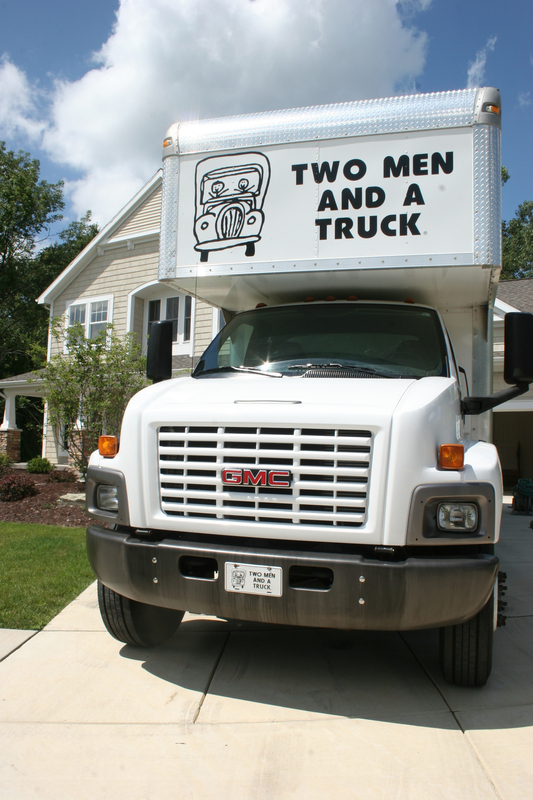 TWO MEN AND A TRUCK® is making great things happen for the customers and communities we serve. Money and profits help us impact lives, and we are grateful and proud we can make a difference. Visit our website to learn more about our company growth and community involvement.